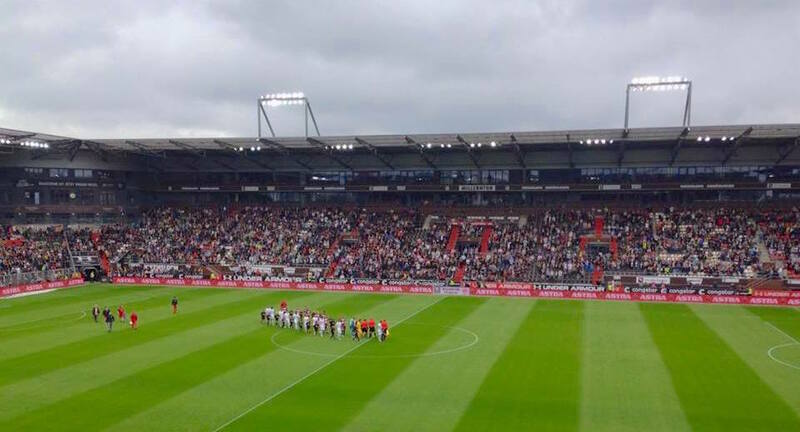 St.Pauli’s league season is already under way with the Hamburg outfit winning their opening game 1-0 at Bochum. But being St.Pauli, the summer has been dominated by off-the-pitch concerns. 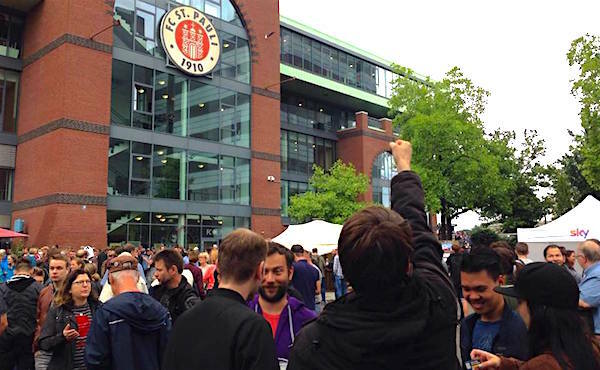 It’s quite easy to see St.Pauli as a kind of footballing Brewdog: a massively successful commercial outfit simply paying lip service to its more anarchic origins. 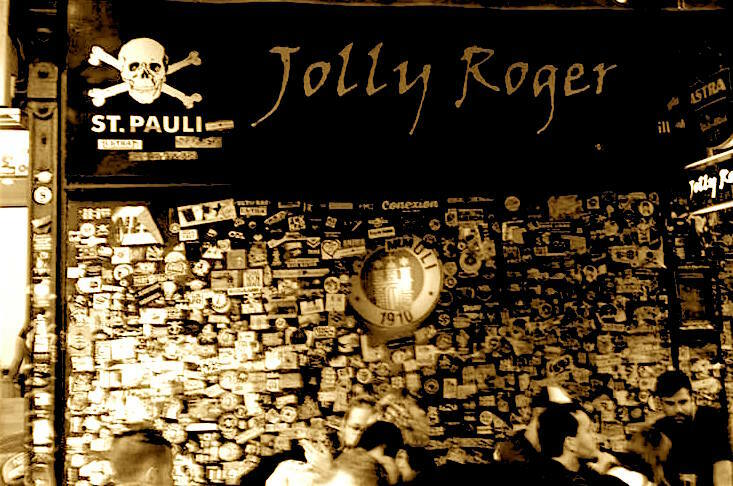 Those who sport the Jolly Roger motif are regularly labelled football hipsters – particularly in England – and there is a degree of resentment towards tourists who splash out on merchandise without buying into the club’s philosophy. Nick Davidson, author of Pirates, Punks and Politics, likens the casual wearing of the St.Pauli hoodie to wearing a Ramones t-shirt without knowing any of their songs. The tightrope between St.Pauli’s commercial success and staying true to their identity is an ongoing discussion amongst its global fan base. St.Pauli are the fourth biggest club in Germany in terms of merchandise revenue after Bayern Munich, Borussia Dortmund and Schalke. Whether this can be reconciled with their punk image asks deep philosophical questions of supporters. Fortunately, they have hardly let the tide of capitalism wash over them. Every move the club makes is questioned, debated and often opposed. From protests against strippers in the director’s boxes six years ago, to a recent rejection by many fans of the club’s new Under Armour kits due to the sportswear brand’s range of hunting equipment, St.Pauli supporters wear their hearts and souls on their sleeves. Even decisions that would be accepted as part and parcel of modern football – such as a ‘strategic partnership’ with Stoke City – have been scrutinised, with fans questioning the ethics of partnering with a club effectively owned by the gambling company bet365. This summer the Millerntor-Stadion housed 200 anti-G20 protesters and set up an ‘alternative media centre’, giving demonstrators against the G20’s arrival in Hamburg a voice they felt was denied by the mainstream media. Former head coach and current technical director, Ewald Lienen, even joined in the demonstrations himself. Such is the pull of St.Pauli: the club has fans thousands of miles away who feel a connection despite never having been to Hamburg. One might think that the significant revenue being generated from the St.Pauli ‘brand’ would allow for more resources to be directed towards the squad, and perhaps the boys in brown could establish themselves as a Bundesliga outfit. However, not all supporters are excited by the prospect of promotion. In recent seasons St.Pauli have been consistent in their inconsistency, with strong seasons following underwhelming campaigns. After flirting with a return to the third tier in 2015, they recorded a fourth-placed finish in 2.Bundesliga in 2016 before dropping down to seventh in their last outing. Despite a confidence-boosting opener, fans aren’t getting carried away by the thought of promotion. While St.Pauli may not be looking to make an assault on the top division anytime soon, crucially they are keeping fans onside – from those born and bred in Germany to their foreign legion. Season ticket holder Maik Kreukemeier writes for St.Pauli fanzine Ubersteiger and lives a few miles north of Hamburg. “We are against globalisation and too much commerce in football, but we’re still a professional football club and need to earn money,” he says. In a sense, these fan groups are a case study of the commercialism debate at St.Pauli. Whilst they may be a symptom of the club’s ‘cool’ and alternative status, groups from Yorkshire to Toronto have been welcomed by Hamburg natives. In turn, these groups have come to represent the best of St.Pauli’s ethos, fighting for social justice and raising money for charities such as Viva Con Aqua – a project founded in St.Pauli that aims to improve drinking water in developing countries. Stickers for these fan groups are plastered all over the famous Jolly Roger bar, and ahead of a friendly against Werder Bremen you could hear just as many people with English accents as those speaking in German. The Millerntor drew over 20,000 fans for the friendly, with the crowd a healthy mix of die-hards and tourists. Outside the Jolly Roger, an Irish stag do serenaded bemused punters with “We all dream of a team of Gary Breens”. This is the new clientele to which St.Pauli has become accustomed. In the age of Trump and Brexit, St.Pauli’s fans feel more emboldened in their fight for the left-wing ideals of the club. The club, its fans, and supporters’ groups from around the world have given considerable support to refugee charities. As ever, the real battle at St.Pauli will not be on the pitch but rather the fans fighting to maintain the identity and values of the club. For all the sneers about hypocrisy and hipsterism, St.Pauli’s values in the current climate are perhaps more relevant than ever. David Cowlishaw is the co-producer of Who Are Ya? – a podcast focusing on a different club every month. 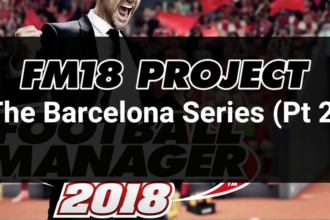 There will be more about St.Pauli in the next episode.